Designed by prominent Christchurch architects Warren and Mahoney, the Brutalist (blocky, using lots of concrete) structure was officially opened by Governor-General Sir Denis Blundell. Featuring wooden panelling and beams, the complex on the north bank of the Avon River overlooking Victoria Square cost about $4 million when completely fitted out, equivalent to $51 million today. $500,000 was raised by public subscription and the remainder contributed by local authorities. 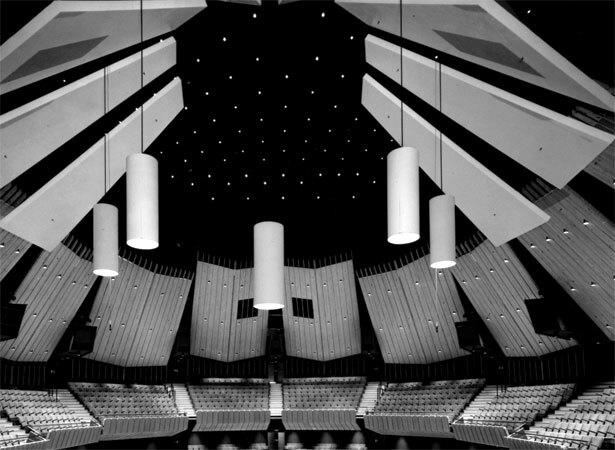 The elliptical concert auditorium seating 2350 people benefited from pioneering acoustical research by Harold Marshall that was later applied to Wellington’s Michael Fowler Centre and buildings overseas. The James Hay Theatre seated 1000 people for drama and chamber music performances. A restaurant and function rooms complemented these facilities. We have 7 biographies, 3 articles, related to New Christchurch Town Hall opens .